Agent 54 here again. I was eggxcited to get this colorful phone call between the foremost distributor of Easter Eggs and the head of the Egg Manufacturing Union. Seems that one side wants a new deal. Will these guys be able to resolve their differences before Easter Sunday? Let’s hope so for the children’s sake. A Bunny Secretary speaks into her bosses intercom: EB, I have Chicky Hoffa from the EMU on line one. Easter Bunny (EB): (sarcastically) Great, just what I need. Okay, I got it. EB clicking line one: Hey Chicky, how are ya? What can I do for ya. Chicky Hoffa, head of the EMU: Hi EB. 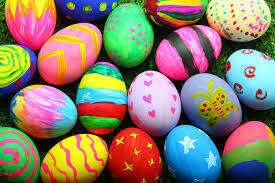 You know we’re busy as heck trying to build up your inventory for this year’s Easter season. EB: Yes, and we appreciate all of your hard work. We’re working around the clock here to get ready too. Chicky: Yeah well frankly, we at the EMU think you could appreciate us a little more and I don’t mean chicken scratch either. EB: Now wait a minute here Chicky, we just made a new deal in 2018, We still got 4 years on our contract. I’m afraid I can’t hop up to the plate to make a new deal at this time. Chicky: (in an elevated tone) Hey fur-ball, you know that ever since the stupid HOP movie came out, demand for our eggs has doubled. My hens are working overtime and we need a bigger slice of the pie if you want us to keep up with demand. We want more of the recognition for Easter too. After all we make the darn things. EB: No need for insults, Chicky. I’m sure you realize that if it weren’t for me you would have almost no demand, I’m the face of your product and let’s not forget my expenses. I have designers, artists, distribution and administrative staff to pay. Chicky: I don’t give a fart about that and I still can’t figure out how you made humans believe that a bunny would deliver decorated chicken eggs. You know, I got an idea. 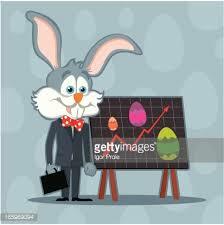 I just might create an Easter Chicken and knock your cotton tail right out of this whole industry. How’s that sound? EB: Is that a threat? 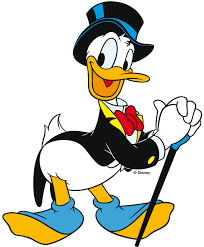 Cause you may not know this but I’ve been talking to Donald Duck and he says that between his ducks and a bunch of quails he’s organized, I can get more than enough eggs to fill my orders. Chicky: Is that what we’re doin here? Usin words? Words like ducks and quails? Is that what we’re doin? EB: Let’s calm down here. We’ve been in business together too long to throw it all away now. Truth is we got a good thing going here and we should be able to figure out how to keep it going. Chicky: Yeah, well I just wanted to remind you that the Lucky Rabbit’s foot industry is starting to take off again. Say, how well do you hop on 3 legs? EB: Alright, this is getting ugly now. Look let’s talk turkey at our next board meeting. I’ll buy you a drink and we can sit down and discuss things like civilized, professional, business animals. Chicky: Yeah, Okay, I’ll be there but remember, I ain’t exactly 100% domesticated either. I’m warning you, don’t tweak my beak. EB: Yes, of course not. You know, I’ve always had the utmost respect for you and your Union. I’ll see ya at the meeting. Holy Cow! I can’t wait to listen in on that board meeting. Heeheehee! Sounds like there's going to be a headliner of a fight if they don't work things out. 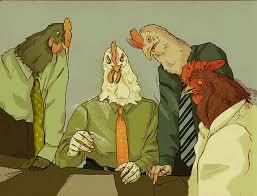 Let's hope they can act like civilized business animals for the children's sake. I think they are going to get in a knock down drag out fight. Just what I think. I hope I'm wrong. Let's hope for the best for the children's sake. Well, we hope things don't get too eggstreme. Chicky Hoffa looks like a tough character! You bethcha! I wouldn't tweek his beak. I'm getting all egg-sighted about it. Yes it could be eggstremely cool. Haha loving the puns! Thanks for linking up! Yes, you should come to Punnsylvania more often. Snort! Punnsylvania. That's great. Thanks for joining us at #FridayFrivolity this week! I'd be happy to eat Easter Chicken. Happy Easter. Thanks for playing. Reminder: Just one post per Lovin Life Linky ;) Thanks! Eggcellent! Glad you enjoyed it. Thanks for playing. For some reasons I was reading it with an Italian accent. lol! Very clever writting indeed. Happy you enjoyed it. Thanks for playing.